Best of the best in chemical-free, orbital dry scrub machines and eliminates 95% of chemical stripping procedures. Heavy-duty, high quality components prepare floors to be refinished in half the time compared to the conventional stripping process. Cleans edges and corners in every room – no stripper run-off and no ruined floors under doors. 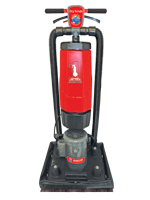 Includes Mercury 6-Quart Backpack attachment for quick and easy clean-up and 1 HP motor with 1725 RPM orbital speed! Cleaning pad size is 12" x 18".